3'x5' polyester flag with white header and two grommets. Most flags have four rows of stitches on the fly and two rows on the top, bottom, and header side. Image is screen printed and appears on both sides. Writing will be reversed on the back. The flag of the 10th Tennessee Confederate Regiment. 3'x5' polyester flag with white header and two grommets. Most flags have four rows of stitches on the fly and two rows on the top, bottom, and header side. Image is screen printed and appears on both sides. Writing will be reversed on the back. One of the regiments of the Irish Brigade. 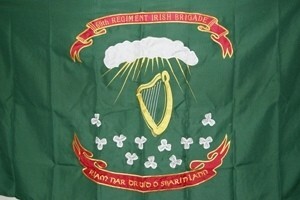 The sewn cotton versions of this flag say "1st Regiment Irish Brigade," instead of "69th." 3'x5' polyester flag with white header and two grommets. Most flags have four rows of stitches on the fly and two rows on the top, bottom, and header side. Image is screen printed and appears on both sides. 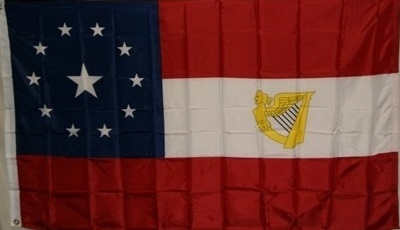 11 Star 1st National Confederate flag with the Maiden of Ireland.